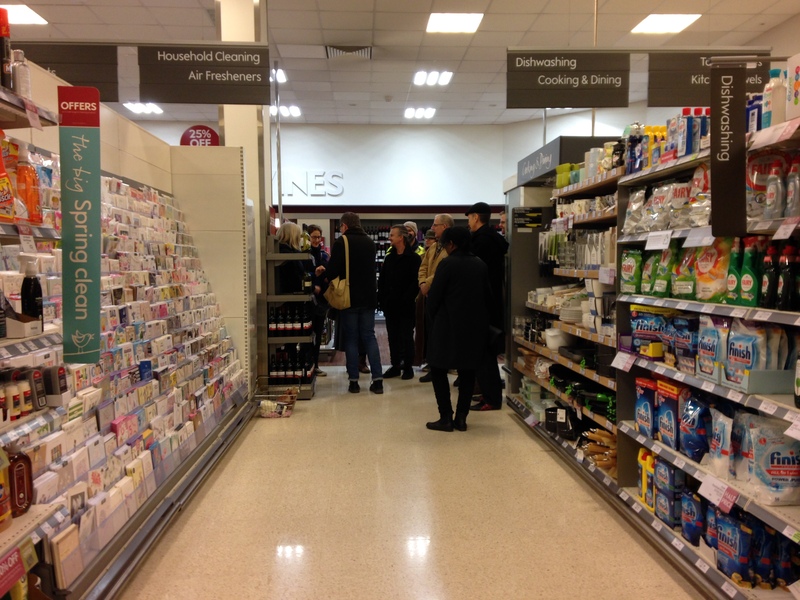 At 11am on a bright sunny Spring Saturday morning on March 21st, 2015, at the agreed starting point outside a train station, and then again at 7pm in the saucepan aisle of Waitrose supermarket on April 1st, 2015, a group of walkers met. 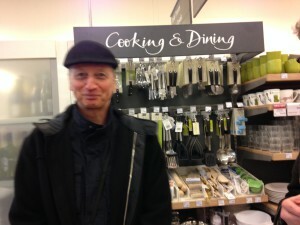 They, too, were setting out to search for something where there is nothing, but this time in Lewes, East Sussex. The group split up and splintered outwards across the local terrain, drawing their drifts on the local tourist maps in ink, and every twenty minutes they paused, looked around, and marked media with their reflections. The material they amassed consisted of passer-by observations, personal asides, memory jogs, local historical and cultural data, physical affects and effects, pit stops for sustenance, poetical musings and connections, unusual discoveries, surreal juxtapositions, navigation and utility politics, kindnesses, coincidences, flotsam and jetsam, repetitions, drift talk, giggling, singing, technical problems, unconscious seepage, weather, and musings on vistas up, down and to the side. 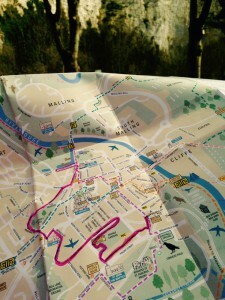 In that instant a map is psychogeographically drawn across, in and with; a map made of a happening that psychically, subtly, imperceptibly, subverts the carefully organised grid-matrix of point-to-point connectors signposting routes to homes, businesses, churches, green zones, conservation zones: inhabited spaces controlled and orchestrated and evolved over hundreds of years by localised navigational decisions. Time-based conceptual map art of this nature allows for room to play and encourages potential inclusion beyond local participation. The clock may say different things depending where you are in the world but a marked pause in time still exists as a synchronous possibility if planned for and shared. A call out on social media as far as California to the west and Nepal to the east was made. With time differences being what they are it was tricky to convince people to commit. This was, hopefully, the first of future Mappening experiments, so perhaps another time. 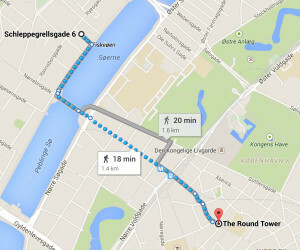 But then, at the last minute, the charge was answered by Mark Johnson, who, then visiting a friend Lydia Marie Storm in Copenhagen, offered to map their walk to the 17th century tower and observatory Rundetaarn, or the round tower, the oldest functioning observatory in Europe. 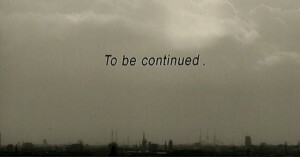 The superimposing of their walk onto Lewes provided some fine topographical surrealism – for example, the flooding of Lewes Convent Field by their traversing the famous Copenhagen Lakes (Danish: Søerne) at around 11.40 GMT. Lewes is synonymous with celebrating one annual calendar event with maximum conviction and seriousness: Bonfire Night. The 1st of May also sees children and dancers with spring garlands processing through the town. April Fools’ Day is not such an important marker on the calendar for Lewes or anywhere outside of the last item on the news (if they’re feeling naughty). By deliberately choosing April Fools for the night Mappening we wanted to have a bit of fun with this local history of historical dress up, fire and loud bangs. So we aimed to walk and defy the night with some gentle playfulness, as anonymous pranksters seeking and spreading subterfuge in the town. Everyone was encouraged (but not enforced) to dress up for the duration of his or her walk (no-one did this), but a certain level of lo-fi surrealism did take place. In ‘Trickster in a Suit of Lights: Thoughts on the Modern Short Story’, novelist Michael Chabon suggests that the “Trickster goes where the action is, and the action is in the borders between things”, Angus Cameron writes in his 2011 essay ‘Trickster in Between,’ that “it is only very recently that boundaries have been reduced to lines on the map. Prior to that, in every recorded human culture, the boundary is the domain of the Trickster; the fecund hermaphrodite menace that torments, mocks and confounds the social norm and, in doing so, enacts and confirms it. For Trickster the boundary is the site of transgression, the locus of mischief – where the action is.” Mappenings are all about playing with borders. 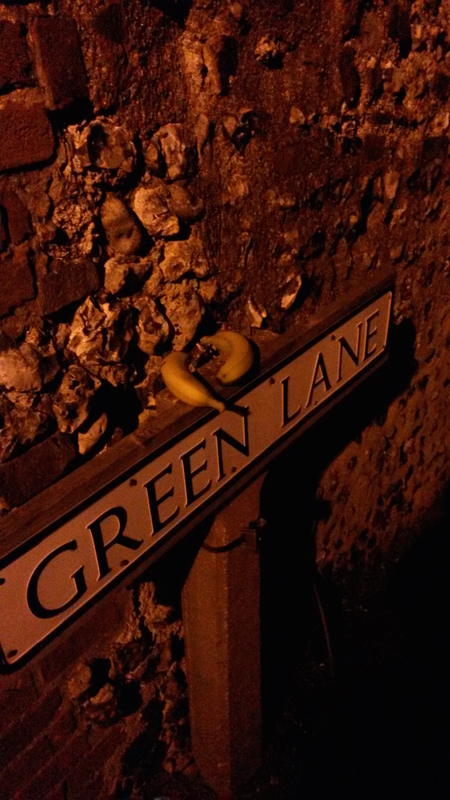 Lewes is leafy, picture-postcard, old-England pretty, and at night, extremely quiet and sombre. But night has a malignant force that can disturb the most peaceful of suburbs. We envisaged that the night walk might be our biggest challenge. Perhaps a good method of projecting self-confidence and enhancing fresh happenings is through making jokes and not taking the darkest of shadows too seriously. What better way to greet the Trickster at the boundary than in the guise of a trickster? 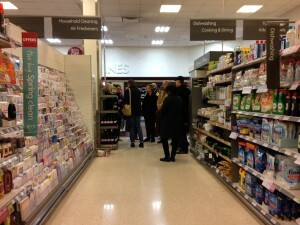 A tremendous sense of low level trespassing (who chooses a supermarket to start a walking tour? The staff eyed us suspiciously) added a frisson of early excitement and camaraderie to the proceedings. From Krazy Kat to 70s sitcoms cultural history centres the banana as that most comedic of fruits. Encouraged to incorporate their banana into their Mappening yielded some fascinating ideas from the group. 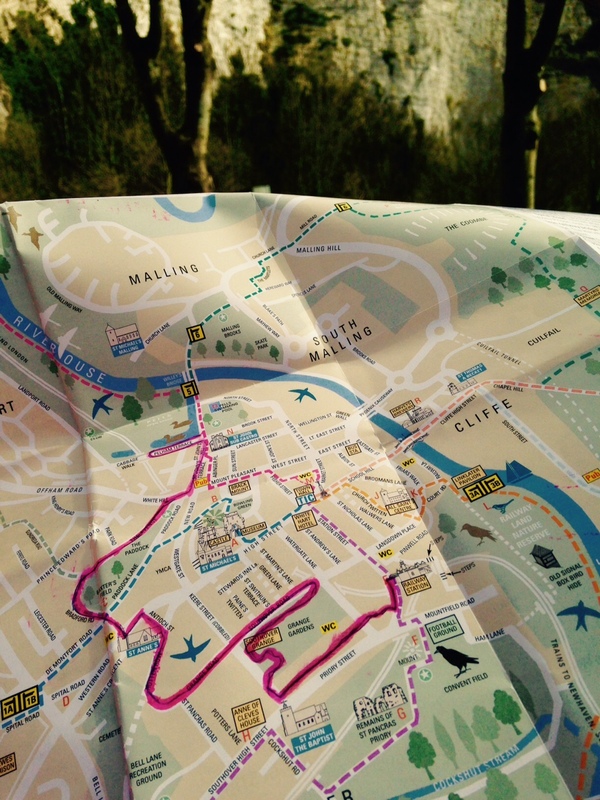 Nancy and Ben Carter marked one end of the yellow curve with an arrow, a spinning on the pavement would dictate the direction of travel, meaning that for some time they were unable to leave the confines of a nearby square! 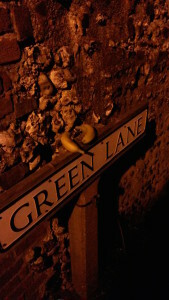 Eventually the banana became the sickle moon in the corner of their collage collecting their ‘psycho-walk’ experiences. In 1975 Brian Eno and Peter Schmidt created the Oblique Strategies deck of cards (subtitled: Over One Hundred Worthwhile Dilemmas) as a creative means to think about approaches to their own work as artists and musicians. These cards were also implemental in some of studio decisions made during David Bowie’s infamous Berlin trilogy of albums. 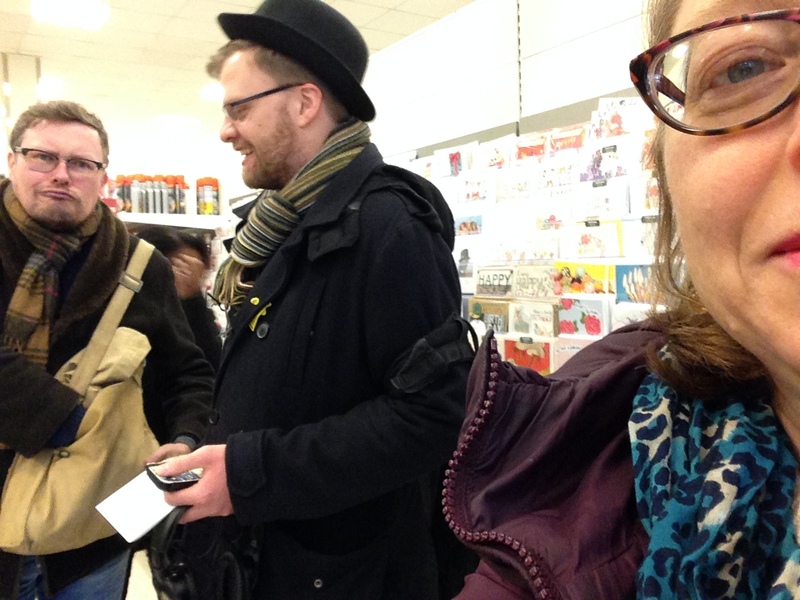 In the supermarket the Mappeneers each picked a card from the deck and decided whether, consciously or otherwise, to allow its advice to guide their walk, again yielding interesting connections. ‘Make it dirty’ sent Jenni Cresswell and her dog Rubik in search of a ‘dirty Lewes’, whilst ‘Be boring’ encouraged Matthew Homer to be anything but. The idea of a series of mixed media time-based interactive online maps only achieved realisation through being introduced to the interactive mapping application www.thinglinks.com. 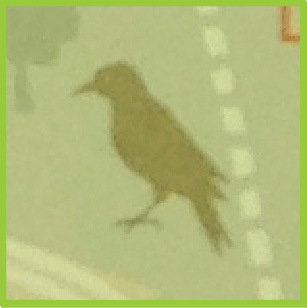 This was suggested by illustrator and map artist Helen Cann. Helen and friend had joined the group for the April 1st Mappening and had some prior experience with Thinglinks. 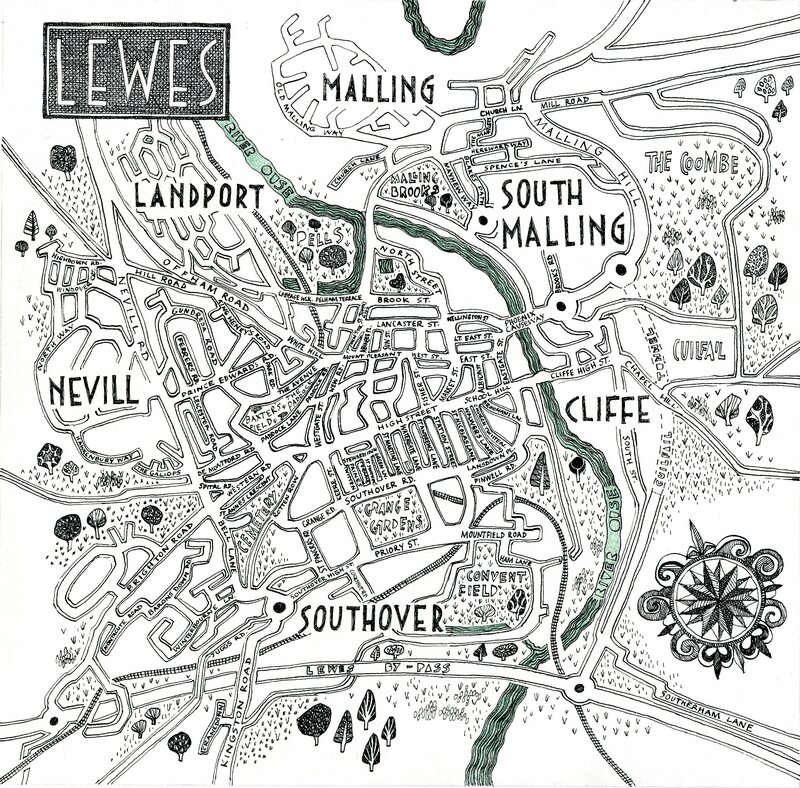 Our conversations eventually led to Helen very kindly producing the marvellous illustrated map of Lewes featured in the interactive maps and throughout the REFRAME New Pathways site. The nine interactive Mappening maps are all pop-up boxes on the skin of Helen’s illustrated map (bar the final cheeky surprise in the April Fools’ Day series). 10 walkers contributed to the Day walk and 7 to the Night walk. Another small pop-up menu on each map lists the contributors and numbers them alphabetically. 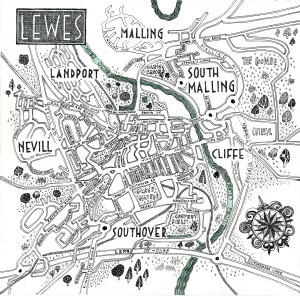 What is fascinating is how the combination of Thinglink interactivity and Helen’s map continues the unique ‘liveness’ of the lived psychogeographic experience made in the streets of Lewes by contributors into an event that can be lived and re-lived by the reader/audience. 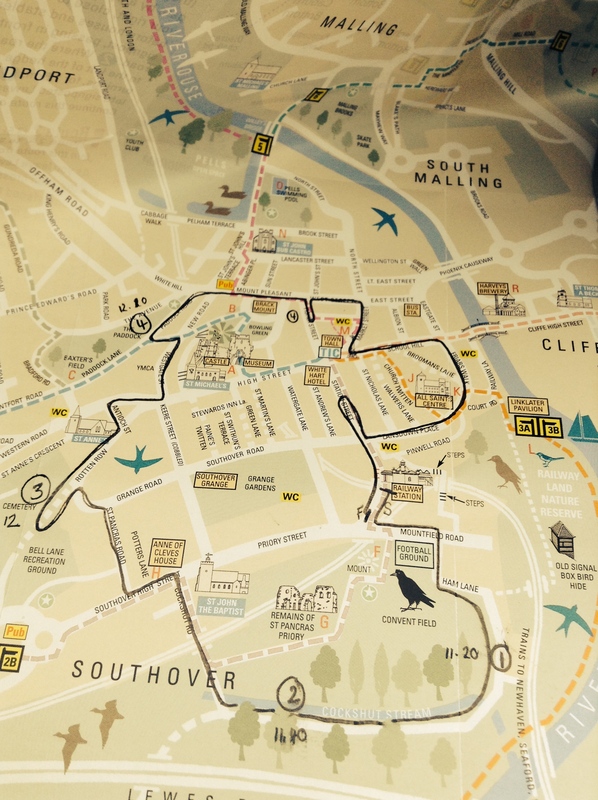 It could be argued that the interactive Mappenings share an experience in direct opposition to that of Google Streetfinder, where the topography is a virtual rendering of the real and favours correct distance, borders, occupation, and so forth, for formulised navigation. In Google Maps time does not exist, certainly not the movement of time through the day, the seasons through the year – there is never night! Time-travel exists though in the patchwork quilt of Google-car drive-thru’s stitching data from different years: a street in 2011 might turn the corner into 2009, for instance. Google’s trademarked 3D globe is accessed with a certain gamification. To drop from aerial to streetview we must take the little orange gummy man by the hand (as if we were a balloon he was holding onto!). We swing him side to side like a doll before dropping him onto a road, a junction, a point of entry down there in the landscape, hoping to hit target. As he falls we metamorphose into him (or he into us) and land in the virtual collage of photographed past with a vertigo thump. Through using the thinglinked pop-up boxes we enter into each individual Mappenings of our own fruition, and when we hit the ground the view is both other and intimate. Google Earth is a strange planet: oddly airless, not a sound. Certainly the terrain is infinitely fascinating, the world there for the exploring, our ground level travels exhilarating yet frustrating. 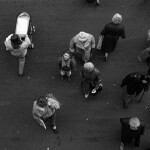 The population is frozen; faces pixelated, cancelled out, individual thought and feelings vanished, the volume turned down. Artists highlight the coincidences and social comment. Conspiracy theorists point arrows at the blurred secrets. Quick to be hip, Google make a selling point of the glitches and anomalies, hand in hand with the majesty and awe – whatever’s your flavour it’s Google Earth promoting difference through sameness, closeness through distance. 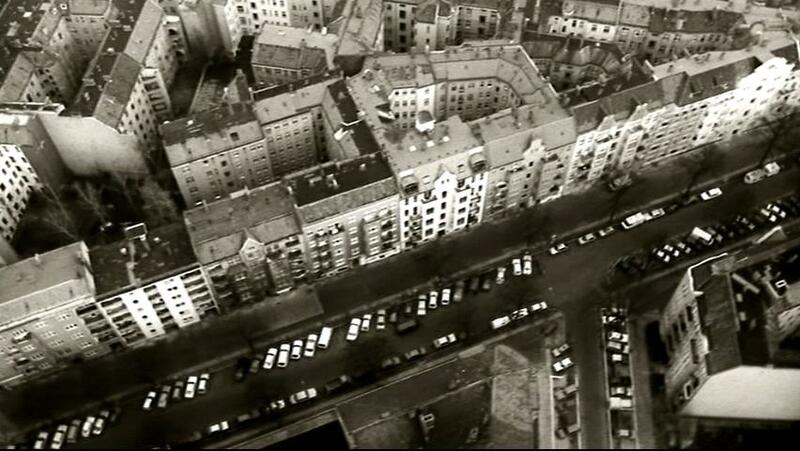 Through building the Thinglink interactive maps of the two Mappening events I was reminded of the opening scenes of Wim Wender’s 1987 film Wings of Desire (German: Der Himmel über Berlin, “The Sky/Heaven Over Berlin”). 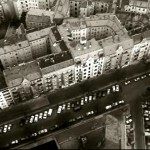 With the smallest budget imaginable the interactive renderings of five reflective still points during the day and four at night seemed to mirror, in some fashion, the flight path of Wender’s camera as an invisible angel passes through the clouds, into an aeroplane descending to land, through the rooms and flats of high-rise low-rent Berlin, before finally dropping down to street level, not to confirm marked territories and committee-named zones, but instead momentarily to hover over individual human souls and listen in to their intimate thoughts and observations, each unique as a fingerprint, spoken in their own personal language and poetry, and then pass on by, even as we are passing on through.